All things should be optional! So everybody can customize the program according to his wishes. Maybe the thing with the graphics could be solved easily: Two diffent versions of cells_gfx.png. One regular like it is today. And one extendet with more animations and different versions of each object. There should be an option in the Play/Select theme menu if it's a regular C64 style graphic or an extended version. Or maybe the program can recognize it on it's own? So everybody would be happy! personally i like the little color variations in boulder remake, too. and i do not like the smooth moving, as sometimes cells are drawn upon each other. the bdremake-style small variations would require more programming, but maybe. Smooth animations are great for enemies (Firefly, Butterfly and Amoeba). Look at my own graphics set (Shabanak) for Boulder Remake. The animations just look great! For your converter: Don't make the assumption that all caves in a CrLi game are CrLi caves. The engine supports 1stB caves as well, as long they don't have ghosts. Check the version string in each cave, and if it is something less than 3.0, then it's a 1stB cave. the version number is checked by the game itself. it even loads the crazy light tutorial correctly, telling ghosts and acid&falling wall apart! Take a look at Crazy Dream 8. In most caves, the settings for diagonal walking and the Diego effects are wrong. It looks much like if a 1stB cave was interpreted as CrLi. Ladies and Gentlemen - I managed to get GDash work on MacOS X! It's running fine in X11. Full screen mode is not supported but this does not matter as the window mode is just great! You can get info on the gdash file and set open with X11. A double click will start gdash without any typing! I think there should be an option for the default window size when starting the application. The default for C64 Boulder Dash would be 12 x 20 elements showing on screen. If the size could be set to 12 x 20 elements in relation to the size of the cells (the window must be larger when the cells are larger, too) then it would be always the real C64 screen size. But it's also great that the window can by resized - a larger visible playfield is also nice! Another great request: A config file that is beeing saved and loaded so that I do not have to set the size of the window, the size of the cells or other things every time I start the app. In addition, it would be nice if scrolling is disabled for intermissions, and only the upper left part is visible then. BTW, a different question. What's actually the meaning of 'G' in GDash? Or did I miss something? Please uninstall the 0.9 version before installing this one, as some imported caves have changed! Arno: gdash is gdash, while many programs in linux, written for the gtk/gnome system, have names starting with g, like gnometris, glade, gthumb, gtranslator and the like. Scrolling/nonscrolling intermissions: do you know any caves where disabling scrolling might do harm? Personally, sometimes I like enlarging the game window and seeing the complete 40x22 cave completely. Also, gdash is capable of managing caves of any size (it's restricted in the editor to 128x128, but not internally limited). I don't really like the idea of restricting the program to the limitations of the original C64 hardware. Maybe there should be an option like that: the cave is 40x22, and of that, the (2,3)-(17,19) rectangle is visible during the game. I noticed not necessarily a bug, but a slight logical problem. A Voodoo Doll is immune to a Bomb, as you implemented it already. Though I think, it shouldn't when "can be destroyed" is checked (which isn't an option in 1stB and CrLi). It is logical, it is intuitive, it doesn't break any compatibility, and I intend to implement it that way in my upcoming engine. 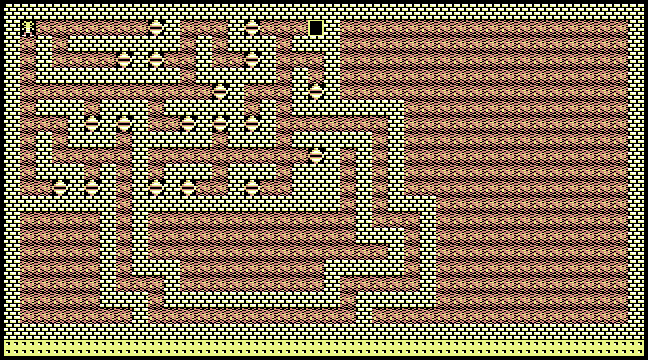 In CrLi caves, slime converts boulders to diamonds which isn't even possible on the C64 since slime always takes element, adds 3 and puts the new element under itself. And some diagonal movement caves are still not set correctly. For instance, Crazy Dream 8 "Dangerous key" should have it checked. Wow, the new version rocks! A bug: Sometimes after starting GDash Diamonds needed is always 1 in all games. Sometimes it's the correct number. But on the Unix version the remaining time is not added as bonus score. Another bug: Marek Roth's Crazy Dream 6/Cave A can not be played because of the bug with the false position Rockford enters the screen. It's correct for up/down but not left/right. If Rockford is leaving the screen on the right it must enter the screen on the left but one line under it. The same in the other direction: if he leaves the screen on the left side he must enter it on the right side on line above! Otherwise all caves using this option will not work! But maybe this could be made an option in Prefs? Is this wise? LogicDeLuxe what do you think of that? Because of your poll: I like the scrollbars - and I like to be able to make the window larger. This is the thing I always missed in the good old C64 original game. There are so many different caves available - and it's really good to be able to look how it could work! hi, the "infinite caves", rockford exiting on one end and coming back at the other, is already defined in bdcff. in original bd, it came back one row under or over the original, but there is also a "perfect borders" setting, so it comes back at the same row. i like the latter, it is already implemented - again, a pc has simply got the computing power to do this. the former is needed for many existing caves, like Arno's future dash caveset. these two will be implemented as an option. I like the optional idea! All things that are optional can be custom set and that's good! But, of course, it must be handeled right when importing caves with any2gdash (if possible).